At Megiddo, over 20 ancient cities lie superimposed upon each other. The site was popular because it is located at a strategic crossroads on the Via Maris and had an ample water supply. To control Megiddo was to control trade of the region and beyond. It was one of Solomon's fortified cities. Megiddo has a long history in the Bible as well as in history. The first recorded battle in history occurred here in 15th century BC between Egypt and Canaanite forces. Megiddo was one of the cities that the Israelites defeated under Joshua. Sisera fought against Israel here. King Josiah was slain in battle here (609 BC) by the Egyptians on their way to fight the Babylonians at the Battle of Carchemish (605 BC). In World War I, the British under Allenby defeated the Ottomans here in 1918. The Hebrew name for Megiddo is Har-Megiddo from which the word Armageddon comes. 11: And Manasseh had in Issachar and in Asher Beth-shean and her towns, and Ibleam and her towns, and the inhabitants of Dor and her towns, and the inhabitants of Endor and her towns, and the inhabitants of Taanach and her towns, and the inhabitants of Megiddo and her towns, even three countries. 19: The kings came and fought, then fought the kings of Canaan in Taanach by the waters of Megiddo; they took no gain of money. 20: They fought from heaven; the stars in their courses fought against Sisera. 27: But when Ahaziah the king of Judah saw this, he fled by the way of the garden house. And Jehu followed after him, and said, Smite him also in the chariot. And they did so at the going up to Gur, which is by Ibleam. And he fled to Megiddo, and died there. 20: After all this, when Josiah had prepared the temple, Necho king of Egypt came up to fight against Carchemish by Euphrates: and Josiah went out against him. 21: But he sent ambassadors to him, saying, What have I to do with thee, thou king of Judah? I come not against thee this day, but against the house wherewith I have war: for God commanded me to make haste: forbear thee from meddling with God, who is with me, that he destroy thee not. 22: Nevertheless Josiah would not turn his face from him, but disguised himself, that he might fight with him, and hearkened not unto the words of Necho from the mouth of God, and came to fight in the valley of Megiddo. 23: And the archers shot at king Josiah; and the king said to his servants, Have me away; for I am sore wounded. 24: His servants therefore took him out of that chariot, and put him in the second chariot that he had; and they brought him to Jerusalem, and he died, and was buried in one of the sepulchres of his fathers. And all Judah and Jerusalem mourned for Josiah. 6: Gomer, and all his bands; the house of Togarmah of the north quarters, and all his bands: and many people with thee. 7: Be thou prepared, and prepare for thyself, thou, and all thy company that are assembled unto thee, and be thou a guard unto them. 8: After many days thou shalt be visited: in the latter years thou shalt come into the land that is brought back from the sword, and is gathered out of many people, against the mountains of Israel, which have been always waste: but it is brought forth out of the nations, and they shall dwell safely all of them. 12: To take a spoil, and to take a prey; to turn thine hand upon the desolate places that are now inhabited, and upon the people that are gathered out of the nations, which have gotten cattle and goods, that dwell in the midst of the land. 13: Sheba, and Dedan, and the merchants of Tarshish, with all the young lions thereof, shall say unto thee, Art thou come to take a spoil? hast thou gathered thy company to take a prey? to carry away silver and gold, to take away cattle and goods, to take a great spoil? 14: Therefore, son of man, prophesy and say unto Gog, Thus saith the Lord GOD; In that day when my people of Israel dwelleth safely, shalt thou not know it? 16: And thou shalt come up against my people of Israel, as a cloud to cover the land; it shall be in the latter days, and I will bring thee against my land, that the heathen may know me, when I shall be sanctified in thee, O Gog, before their eyes. 17: Thus saith the Lord GOD; Art thou he of whom I have spoken in old time by my servants the prophets of Israel, which prophesied in those days many years that I would bring thee against them? 18: And it shall come to pass at the same time when Gog shall come against the land of Israel, saith the Lord GOD, that my fury shall come up in my face. 20: So that the fishes of the sea, and the fowls of the heaven, and the beasts of the field, and all creeping things that creep upon the earth, and all the men that are upon the face of the earth, shall shake at my presence, and the mountains shall be thrown down, and the steep places shall fall, and every wall shall fall to the ground. 22: And I will plead against him with pestilence and with blood; and I will rain upon him, and upon his bands, and upon the many people that are with him, an overflowing rain, and great hailstones, fire, and brimstone. 23: Thus will I magnify myself, and sanctify myself; and I will be known in the eyes of many nations, and they shall know that I am the LORD. 3: And I will smite thy bow out of thy left hand, and will cause thine arrows to fall out of thy right hand. 4: Thou shalt fall upon the mountains of Israel, thou, and all thy bands, and the people that is with thee: I will give thee unto the ravenous birds of every sort, and to the beasts of the field to be devoured. 5: Thou shalt fall upon the open field: for I have spoken it, saith the Lord GOD. 6: And I will send a fire on Magog, and among them that dwell carelessly in the isles: and they shall know that I am the LORD. 7: So will I make my holy name known in the midst of my people Israel; and I will not let them pollute my holy name any more: and the heathen shall know that I am the LORD, the Holy One in Israel. 8: Behold, it is come, and it is done, saith the Lord GOD; this is the day whereof I have spoken. 10: So that they shall take no wood out of the field, neither cut down any out of the forests; for they shall burn the weapons with fire: and they shall spoil those that spoiled them, and rob those that robbed them, saith the Lord GOD. 11: And it shall come to pass in that day, that I will give unto Gog a place there of graves in Israel, the valley of the passengers on the east of the sea: and it shall stop the noses of the passengers: and there shall they bury Gog and all his multitude: and they shall call it The valley of Hamon-gog. 12: And seven months shall the house of Israel be burying of them, that they may cleanse the land. 13: Yea, all the people of the land shall bury them; and it shall be to them a renown the day that I shall be glorified, saith the Lord GOD. 14: And they shall sever out men of continual employment, passing through the land to bury with the passengers those that remain upon the face of the earth, to cleanse it: after the end of seven months shall they search. 15: And the passengers that pass through the land, when any seeth a man's bone, then shall he set up a sign by it, till the buriers have buried it in the valley of Hamon-gog. 16: And also the name of the city shall be Hamonah. Thus shall they cleanse the land. 17: And, thou son of man, thus saith the Lord GOD; Speak unto every feathered fowl, and to every beast of the field, Assemble yourselves, and come; gather yourselves on every side to my sacrifice that I do sacrifice for you, even a great sacrifice upon the mountains of Israel, that ye may eat flesh, and drink blood. 18: Ye shall eat the flesh of the mighty, and drink the blood of the princes of the earth, of rams, of lambs, and of goats, of bullocks, all of them fatlings of Bashan. 19: And ye shall eat fat till ye be full, and drink blood till ye be drunken, of my sacrifice which I have sacrificed for you. 20: Thus ye shall be filled at my table with horses and chariots, with mighty men, and with all men of war, saith the Lord GOD. 21: And I will set my glory among the heathen, and all the heathen shall see my judgment that I have executed, and my hand that I have laid upon them. 22: So the house of Israel shall know that I am the LORD their God from that day and forward. 23: And the heathen shall know that the house of Israel went into captivity for their iniquity: because they trespassed against me, therefore hid I my face from them, and gave them into the hand of their enemies: so fell they all by the sword. 24: According to their uncleanness and according to their transgressions have I done unto them, and hid my face from them. 26: After that they have borne their shame, and all their trespasses whereby they have trespassed against me, when they dwelt safely in their land, and none made them afraid. 28: Then shall they know that I am the LORD their God, which cause them to be led into captivity among the heathen: but I have gathered them unto their own land, and have left none of them any more there. 29: Neither will I hide my face any more from them: for I have poured out my spirit upon the house of Israel, saith the Lord GOD. 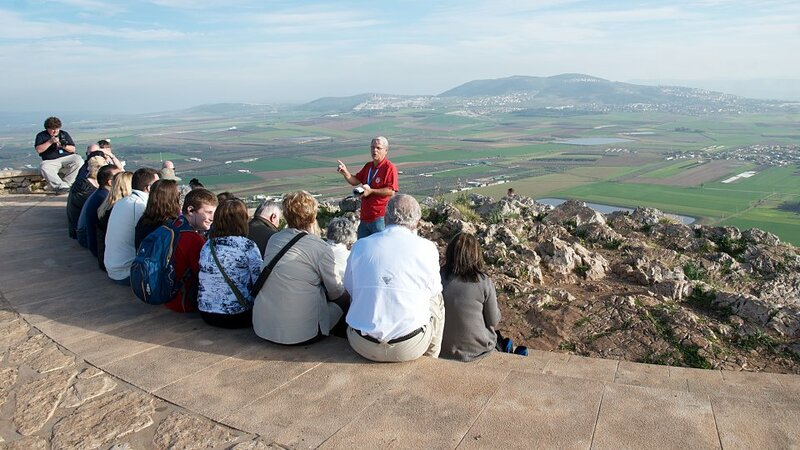 The Valley of Armageddon has been known as a place of many battles in history and for the great battle to come. In a place of warfare it is wise to reflect on the armor of God for the Christian wrestles not against flesh and blood, but against principalities, powers, wickedness, and the darkness of this world. The command of God here is simple, put on the armor of Christ that you may withstand evil and be a bold ambassador for the gospel of Jesus Christ. 10: Finally, my brethren, be strong in the Lord, and in the power of his might. 11: Put on the whole armour of God, that ye may be able to stand against the wiles of the devil. 12: For we wrestle not against flesh and blood, but against principalities, against powers, against the rulers of the darkness of this world, against spiritual wickedness in high places. 13: Wherefore take unto you the whole armour of God, that ye may be able to withstand in the evil day, and having done all, to stand. 16: Above all, taking the shield of faith, wherewith ye shall be able to quench all the fiery darts of the wicked. 20: For which I am an ambassador in bonds: that therein I may speak boldly, as I ought to speak.